Many who enjoy Cognac also love Whisky – or Whiskey – (the difference being that the extra ‘e’ in the spelling denotes Irish Whiskey, as opposed to Scottish Whisky – also referred to as simply, Scotch. But we’ll talk more about that all important ‘e’ in just a moment). And yes, many people are aware that Cognac is made from grapes, and Whisky from grain. And we’ll cover Brandy too. But the story certainly doesn’t end with the grape versus grain saga. Before we talk about the difference between Whisky and Cognac and brandy, let’s mention a couple of similarities. All are fermented, and convert sugar to ethanol. And they’re aged in wooden barrels: In general, the longer they age, the smoother the taste becomes. The spirits pick up quite a lot from these wooden barrels – and this includes both color and taste. And Scotch and Cognac share the method of distillation in pot stills. Both spirits are distilled at a low proof. So let’s get to the crux of the matter. Because there really are some major differences between Whiskey and Cognac (and brandy). And it all begins with the raw materials, more than the methods and how to consume the actual product. Whiskey is made from grain, most usually barley. That is then mixed with water and yeast and is then distilled. The spirit is then aged in oak barrels. Oh, and a little more information about that ‘e’ that you see in Whiskey, or not, as the case may be. In addition to denoting whether it comes from Scotland or Ireland, when spelled ‘Whisky’ it can also come from Japan or Canada. And when it’s Whiskey, it could also be from the US. No-one ever said that drink labels were clear cut…! The name “brandy” comes from Dutch “brandewijn”, meaning burnt wine. And that is quite a good name, as wine is distilled for brandies and of course Cognac. 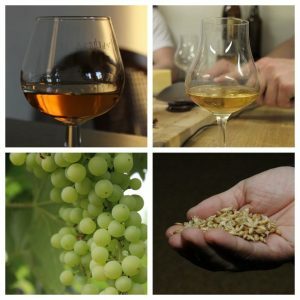 As already mentioned, the raw material of Cognac is grapes – the juice of which is fermented creating an acidic wine – perfect for cognac production. The juice is fermented about 5 days before distilling, (Cognac undergoes a double distillation process), which creates what’s known as eaux-de-vie. This is then aged over years in oak casks. 2. What about age? Is Cognac older than Whisky? Both Cognac and Whiskey are aged in casks. The youngest Cognac is referred to as a VS, or *** (3 stars). The minimum age of such a product is two years. However, some are aged for much longer than this – in some very special cases, over a hundred years old. Cognacs (and Brandy) tend not to denote age by numbers. Instead, they use the terms VS (over two years old), VSOP (over four years old) and XO (over six years old). However, many Cognacs have components that are far older than this. 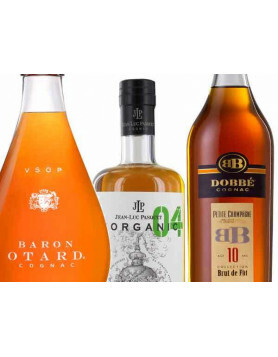 We explain in more detail these terminologies and others in our article about understanding Cognac ages and labels. While Cognac and Brandy use age terms such as VS, VSOP or XO, Whiskey shows the exact age of its content. For example 3, 5, 10, 12 or 15 years. There are also Whiskies at 18 years, but older ones somewhat rarer. So actually, it’s really not a clear cut answer as to which is older, Cognac or Whisky. A 15-year-old Whisky is older than a VS Cognac. But an XO Cognac may well have some eaux-de-vie within its blend that could legitimately be 50, 80, 90 or even 100 years old or more. If we’re talking old school, then Cognac was traditionally seen as a digestif. A drink to enjoy after dinner, perhaps with a coffee or paired with a cigar. However, Cognac has done much to shake off the ‘stuffy old man’ image in recent years. It’s now the drink of uber-trendy hip hop stars and one that the Millennials are falling in love with. You only need look at the new, trendy Cognacs on offer to see that the drink has had a massive surge in popularity with ‘Generation Y’. Nightclub shelves are stocked with Cognac -and it now features in many a favorite cocktail (a throwback to the time, decades ago, when it was also drunk in such a fashion). Whiskey, on the other hand, certainly didn’t fall foul of such a conservative image in recent years. Although it has to be said, it’s still a truly traditional drink. But Whisky doesn’t seem to have suffered the fall in popularity that befell Cognac a couple of decades ago. Thankfully, the world has now rediscovered its love affair with Cognac – and about time too! Regarding how to drink the spirits. Well, there was a time when it would’ve been said that while you add water to a Whisky, you’d never do that with a Cognac. Simply because the structure of each is totally different – because Whisky is grain based and Cognac is fruit based. But today, this certainly isn’t true. Because there’s many a Cognac that you can certainly add a drop of water too, in order to release different flavors. The upsurge in the popularity of cask-strength Cognacs has certainly seen to that. And it’s now perfectly acceptable to take your Cognac ‘on the rocks’ – in the same way as you might a Whisky. 3. Is one better than the other? So, as you can see there are some major differences between Cognac and Whiskey. But is one better than the other? Well, that’s something that can only be decided by you. We, of course, are biased towards Cognac, as you can read here. But if forced, we’ll taste the occasional Whisky (or Whiskey), it has to be said. In fact, we don’t think you have to be a ‘Cognac person’, or a ‘Whiskey person’. You can simply enjoy the best of both. We’ll be shot down in flames by many for that comment, we’re sure. 4. And what about brandy? And last but not least – what is the difference between brandy and Cognac? Well, that’s simple… Because ‘all Cognac is brandy, but not all brandy is Cognac’. 10 Whisky, Brandy and Cognac commercials: What were they thinking? I’m a big Scotch Malt Whisky drinker and enjoy many varietes of whisky at various strengths. Why though is it so hard to get cognac at cask strength? I have only ever seen at cask strength twice (both around 50% ABV) and both of these examples were bottled by Scottish Independant Whisky bottlers. I enjoy cognac but often feel it would benefit from just a little higher ABV. Can you direct me to any sources of higher strength cognacs or any particuarly good examples? There is plenty of cognac avaliable in the UK but as I said I’ve only found two above 40% ABV (which is the Legal minimum for Scotch Malt Whisky). This article is utter nonsense. Your lack of whisky/whiskey knowledge clearly shows. Author wrote: “While cognac and brandy uses age terms such as VOP, VS, VSOP or XO, Whiskey shows the exact age of its content: for example 3, 5, 10, 12 or 15 years. There are also Whiskies at 18 years, but older is rare. Thanks Gman. Could you be so kind to tell us what exactly you mean? 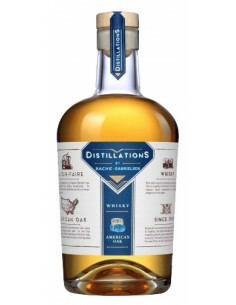 It’s true we are not whiskey specialists, but we talked to one – so this article is based on an exchange with a person who seemed to be quite informed. The second sentence you quote might be a bit misunderstandable: we were trying to point out the difficulties of the ageing topic with cognac grades. It’s always quite complicated. Verdict: consumers don’t understand VS, VSOP but numbers are easier. The third sentence you quote we modified. We were trying to say that whiskey is more present in in social life, with young and old people, mixdrinks and neat. 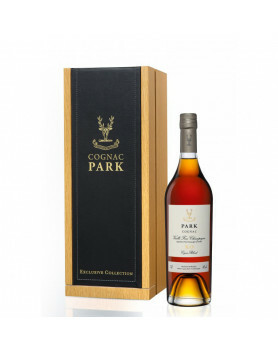 Cognac remains a spirit that is considered “old” “expensive” and grandpa’s drink. Slowly the cognac cocktail culture is (re)inventing itself. I’ve been a whisky and whiskey drinker for 30 years. Rye, single malts, bourbon, you name it. Recently I discovered Hine Rare cognac as well as some of the dirt cheap French brandy out there. I was impressed by the Hine and the brandy and my doctor tells me cognac and brandy are better for me than whisky(ey). That’s health wise. He’s also a single malt fan. Great blog you got. in a spirit world where nothings seems holy anymore, one can use wooden wine and port casks, but you can easily combine just the 2 spirits, especially a few spoons or drops of a smooky peated islay combined with a french XO brandy will be really surprisingly good. a real cognac is made of champagne, brandy can be seen as a step higher than port-wine and lower than cognac and the good ones also come from france. The author couldn’t reply to a very good question: why there isn’t cognac in cask strength? When you wrote that you can add some water to the whisky but rarely to cognac, the reason is clear: the cognac distillery has already added the water for you. The most appreciated whiskys are bottled cask strength and there sometimes a drop of water can bring out aromas. To at #7: Cognac is not ‘made of ‘champagne’. It is made in a different geographical area and from different grapes to those used in Champagne (the wine) production. There is a little typo; Brandy comes from the Dutch word ‘Brandewijn’. Firstly can I say what a great site, as a cognac drinker, I had no idea that so much information was available. A good friend noticed I was enjoying a Remy Martin on my birthday, she then told me that her Grandfarther bought her 2 bottles as a keepsake when she was Born 32 years ago, they are still sealed and in the original boxes. They are REMY Martin VSOP In the old green frosted bottle. Firstly will it be ok to consume, I said that it would probable get better with age, but wasn’t sure. Secondly would it be worth any more than a bottle bought today. To #8 elavapullo: When Cognac has been aged it will have about 40% alcohol from the cask. Hi I heard a longtime ago from an old cockels man inYork City that brandy is good for a bad heart, and bad for a good heart. he lived on it made with an egg staind through a tea strainer to make sure it was smooth, he had heart problems and lived till an old age probably into late 80’s However since then I have also heard it’s a myth can you posibly shed any light on it as far as it being a fact ect kind regards Bob. THANKS – For your Input – It’s Was Very Helpful. What is the sugar content of brandy (I’m thinking more of US brandy than French Cognac) compared to Scotch Whiskey, Canadian Whiskey, or Bourbon? Is it OK to replace Brandy with Whiskey in recipe? In lay mans terms: Beer vs Wine, lol. I’m a beer drinker so I pick Whiskey. Where as a wine drinker might drink brandy, haha. Different strokes for different folks. If you a nose in the glass kind of person, go for the brady and wine, lol. I see these yuppies all the time at the bar with their nose in the glass, lol. Just drink it and enjoy it. People act like: Oh my God!! I can smell cherrys, banana, sunflower oil, and a hint of mint. Oh my God, it’s a hint of mint!!!!!! I truly hate people when they’re trying to be intellectual wine or whiskey drinkers. Especially at eh bars. With their nose in the glass acting like they’re professional drinkers. I think a simple whiff is okay, but putting your nose in the glass is somewhat silly and it makes you look like a tool. Oh my God, like whatever!!! I can like smell grapes and water, oh my God!!! With a hint of cherry, wait a hint of orange dipped in cream at my mother ranch in Texas. Oh my god and I can also smell butterscotch from that old drug store right around the corner where I lost my virginity in 1995. First of all I was unaware and a bit puzzled about how this liquor was actually spelt and only now come to understand that “WHISKY” comes from Scotland, Japan or Canada. Whereas, “WHISKEY” comes from Ireland and the United States..
Now would like to know if Cognac and Whiskey are one and the same and which is good for health? I’m in North Carolina, love beer and moon shine. Sitting back in my swing slowly consuming cognac and a good cigar life can’t be better. Just saying, enjoy life people! I’m a cognac drinker HENNESSY is one of my favorite,good people try it with only ice you’ll feel the goodness in it that smooth taste . I like the article. I think Max explains very well why cognac is currently less popular than whisky/whiskey. Courvoisier attempted to go against the grain with their 12 and 20-year old Connoisseur series. I think they should be commended for that. They could put an XO label on the 12-year version yet they sell it at a VSOP price. The article failed to talk about Armagnac which is a brandy very similar to Cognac but from a different region of France. Due to the less prestigious name you can often get a better Armagnac than the similarly priced Cognac. There are a few cask strength cognacs available. But most cognacs are bottled at 40-42% ABV probably by tradition or by a bad marketing strategy that says that you can make more money selling more volume, albeit at lower %ABV. And yes, Cognac is typically older than Whisky… While you can find some very rare single malts aged 50-60 years (Macallan for example) you can find a large number of cognacs aged over 100 years and plenty of them aged 70-80 years. The relatively common Martell Extra from the 1950s carried the label “Plus de 70 ans en futs” more than 70 years in casks. Quite a few vintage cognacs bottled in the 1960s were distilled in the 1860s and carry the label 100 ans d’age (100 years in casks). Thanks Michael – very good points. The level of discourse above is poor enough to remind me why reading threads can be frustrating. Armagnac uses single pot distilling — unlike cognac — and is made from one or various grapes, is aged in local wood, and is more intense than cognac. Armagnac is more robust than its counterpart; more likely the one whisky lovers will enjoy most. Both are splendid spirits and I recommend spending the time to better understand how the stuff is made. One significant feature of armagnac and cognac is the strict disclosure system used by the apellation system it borrows from the wine world. I do think Scotland can stand to improve on this vital aspect of superior control of production. Lastly, the value of aged armagnac makes it much more affordable than a comparatively fab aged whisky. In the end, armagnac is extraordinary. Bcs of whisky prod rules (age only in casks and no glass, for example) one cld not really enjoy a 100 or 200 year old whisky. The same is not the case for armagnac or cognac. For the price of an overinflated single, one can enjoy an extraordinary armagnac for significantly less money. Salut and Cheers! Hi Jacqueline, thanks a lot for your comment. Cognac comes from france not dutch. I’m enjoying a small glass of Remy Martin VSOP with my pipe as I write this. I’m no Cognac, wine, or Whisk(e)y snob. I just enjoy what I like. There must be snobs out there of course or we wouldn’t know what was good to try in the first place. When it comes to beer though, you can count me in with the beer snobs. Whisky has no “e” in it! To be an expert you really need to know this and also drinking to much of it will give you gout. thanks for your comment! I will see what I can do to remove that mistake. Try it all, including rum.